The Partiologist: Love & Kisses! This may not be the prettiest of the party decor, but in my honest opinion, these were the tastiest! Two of my favorite things...Scotcharoo Bars and Brownies. 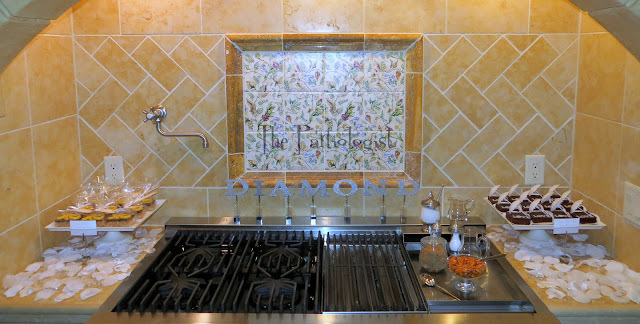 Like I said I use every inch of my kitchen space...on each side of the cooktop, the sweets were displayed on square cake stands, with white rose petals and gemstones scattered beneath. Hugs and Kisses for the Soon to Be Mrs.
On the left a very sweet take home treat~Scotharoo Bars! 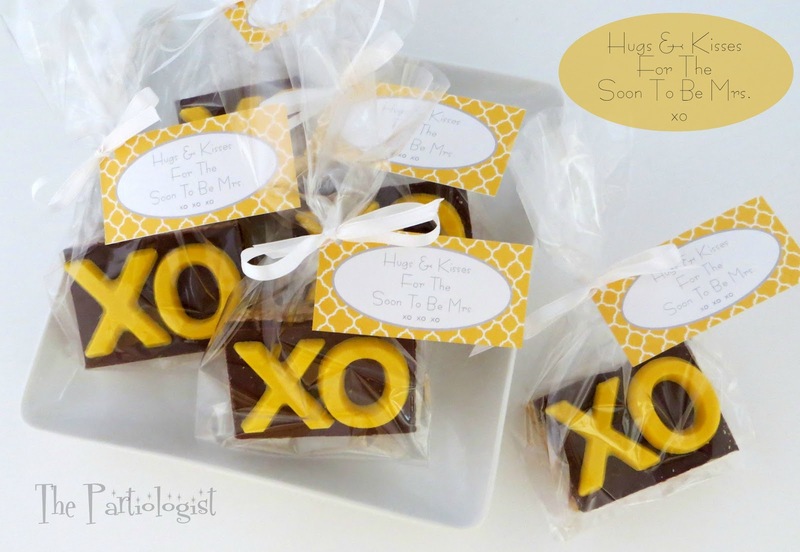 Topped with a yellow chocolate X O (I made with a mold and candy melts). "Hugs & Kisses For The Soon To Be Mrs."
That little jingle came to me very early one morning! And then I decided to top brownies with the umbrella, add fondant letters spelling out LOVE. 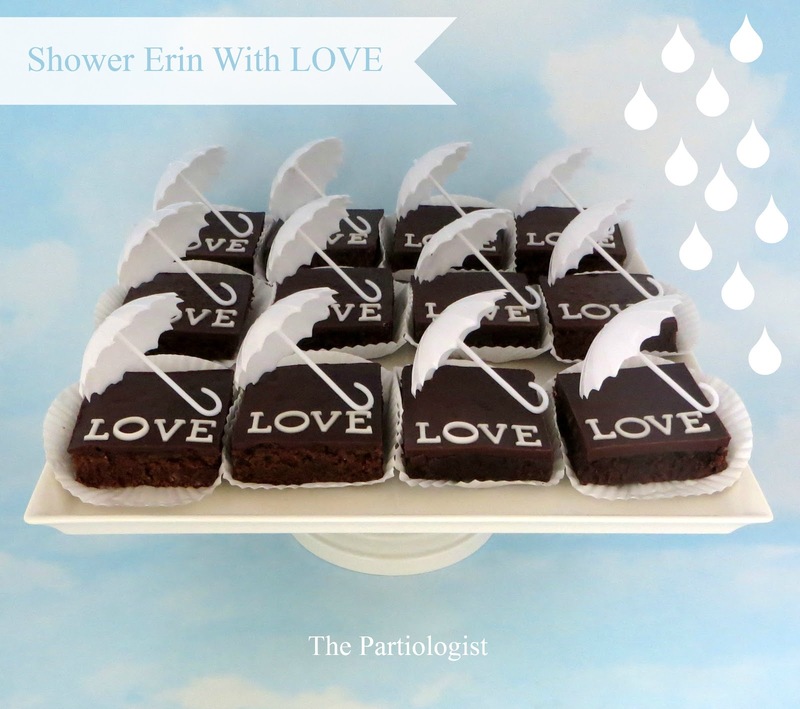 I called them "Shower Erin With Love Brownies". You are so darn creative! 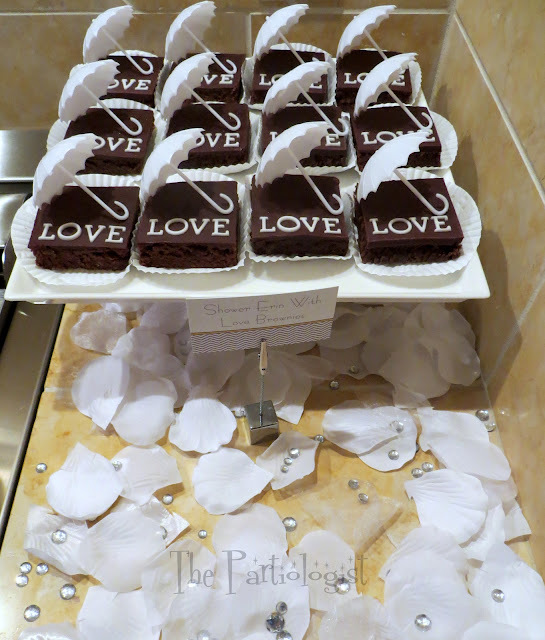 Love the LOVE brownies with the cute little umbrellas! I was happy to find a use for the umbrellas! Everything looks delicious! I'm still waiting for someone to figure out a way to fax those desserts! In the meantime, I'm ordering the little letters to make some of my own! Thank you - I can't wait to show you the rest!! The *Shower Erin with Love* brownies are so creative and so sweet! Love everything you did for this shower. Thank you Brenda - Erin loved everything! I actually think that they look very pretty indeed, in fact the Scotcharoo bars with the tags are so well done. LOVE all of these ideas! My grandma used to make Scotcheroos when I was a kid and I thought they were heavenly. Thanks for linking up, you did it just perfect! !